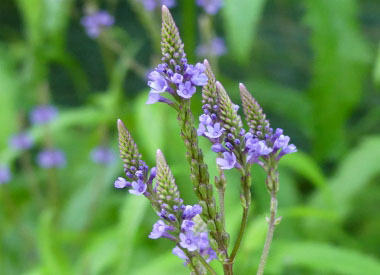 Warning: blue vervain can interfere with blood pressure medication and hormone therapy. 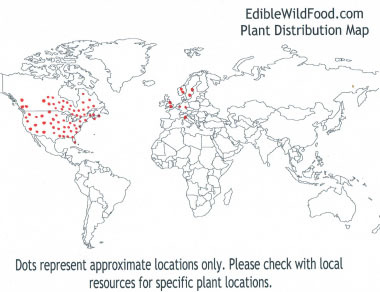 Do not eat any part of this plant if this applies to you! Also, large doses can induce vomiting and diarrhea. Blue vervain is a flowering plant in the Verbenaceae (vervain) family that not only grows wild, but it is a favourite choice in landscaped gardens. This is a perennial wildflower that is unique because it has flowers on showy candelabra-like spikes. Bees are among the important pollinators for this plant. In ancient times the plant was thought to be a cure-all among medicinal plants and the genus name is Latin for sacred plant. Distinguishing Features: Blue vervain is a tall and erect wild edible plant that occasionally branches at the upper half of the plant. The stems are unique as they are 4-angled sometimes with fine white hairs. It emits no scent. Depending on the geographic location, the blooming period occurs anywhere from late spring to late summer and lasts between one to two months. Blue vervain roots are fibrous and short rhizomes. Flowers: This perennial wildflower has numerous, pencil-like flower spikes that branch upwards that appear similar to the arms of a candelabra. Each flower spike has a ring of blue-purple flowers. The flowers at the bottom of the spike bloom first, and the ring of flowers appears to advance upward to the tips of the spike. Despite the name, some of these plants (depending on conditions) will produce flowers that are lavender and in some cases, even white. 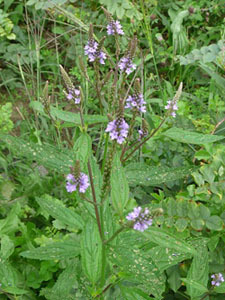 Fields of Nutrition has medicinal benefits and vitamin/mineral content of Blue Vervain. 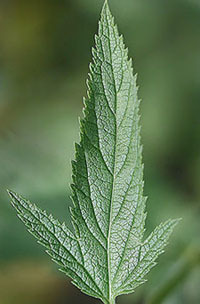 Leaves: The blue vervain leaves are opposite, lanceolate (or oblong) reaching anywhere from 3 cm to 17 cm long and on average 5 cm wide. They are dark green, have a rough texture to the touch and are strongly veined. The margins are double-toothed or serrated. 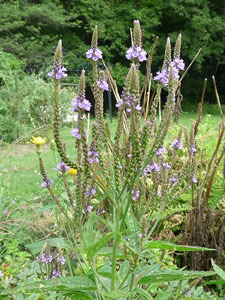 Height: Blue vervain depending on location, soil quality and weather conditions can grow anywhere from 30 cm to just over 2 metres tall. 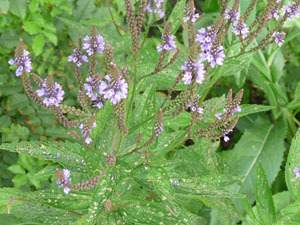 Habitat: Blue vervain prefers moist conditions with full to partial sun. It grows in disturbed areas and is commonly located in moist meadows, thickets, riversides, marshes, and pastures. It is found in many countries but in abundance throughout Canada and the U.S.